Satu Kekalainen Kimbley Bio | SatuArt.ca – Art by Satu Kekalainen Kimbley, Cape Breton Nova Scotia. Satu’s studio is located on the shores of the beautiful Bras d’Or Lakes in Cape Breton. 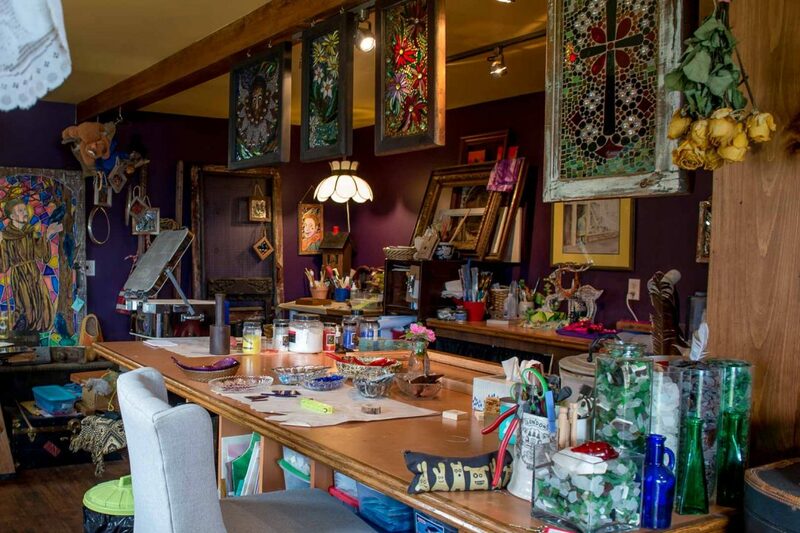 The artist, Satu Kekalainen Kimbley, creates stained glass mosaics, fusion glass, panel paintings and illustrations using a variety of media and techniques. The studio prides itself in reclaiming old windows, doors and treasures others would easily discard. In fall of 2017, Satu’s art studio, The Red Raven Art Studio was rebranded to Satu Art. Satu grew up in Kuopio, Finland where her father, Seppo Kekalainen is an artist, he encouraged creativity in the home all throughout her childhood. Satu immigrated to Canada in 1982, where she met her husband, David. In her early twenties, Satu started training in the field of arts and craft as she attended George Brown and Georgian College for graphic design. The graphic design program encouraged Satu to work in various mediums and techniques. She later directed the art department of the families printing business doing typesetting, logo design and ad layouts. While living in the Northern Ontario Satu had an opportunity to study water colour painting with a local artist/illustrator, Martha Brestovansky painting portraits of children. In 1997 the family moved to Cape Breton. While continuing to paint, Satu enrolled in a stained glass course instructed by Robina Bagnell. These classes were held in the Cape Breton Lyceum. This led her to experiment with mosaic work. Satu enjoys working with small detailed pieces that are used to assemble the mosaic. In many ways, although the medium is glass it resembles her early work in water colour with its attention to detail and colours that pop. Satu is a mother of six children who has inspired all of them to pursue their creative gifting and talents. She and her husband work together in the studio. Satu completed a Bachelor of Theology at Acadia University in Wolfville, NS. in spring of 2016. During that summer she also studied icon painting using traditional egg tempera techniques at the Orthodox Valamo Monastery in eastern Finland.